Now that the nights are long and there’s a definite nip in the air, it’s time to make sure your home is as comfy and cosy as it can be, as we’ll be spending a lot more time indoors over the next few months. Our trend alert on p.20 this month is inspired by misty moors and the rich colours are perfect for giving your home a warm and welcoming feel. Now that the nights are long and there’s a definite nip in the air, it’s time to make sure your home is as comfy and cosy as it can be, as we’ll be spending a lot more time indoors over the next few months. Our trend alert on p.20 this month is inspired by misty moors and the rich colours are perfect for giving your home a warm and welcoming feel. And if you’re thinking of getting a new sofa before your family and friends arrive for Christmas, then make sure you read our expert guide on p.36 for all the information and inspiration you need to pick your perfect settee. We also take a look at the latest ovens which are big on style and features, but kind to your pocket – ideal for cooking your Christmas dinner (p.48). If you’re thinking of moving home in the New Year, then turn to p.106 to find out how to discover where the latest property hotspots are in your area. Bonfire night is a great excuse to have a get-together before we all get too busy in the run-up to the festive season. On p.100 we’ve got some fantastic recipe ideas for you to try at your fireworks party – I particularly love the spectacular bonfire cake, it’s a real showstopper that will definitely ‘wow’ your guests! 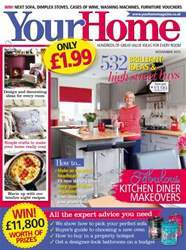 As always we’ve got some stunning makeovers, including kitchen diner revamps packed with clever ideas (p.24), plus some gorgeous reader homes that I know you’ll find inspiring (p.73).